The persistent amazon FBA third party vendor is constantly gazing for some fresh great products to add to his/her private label brand. However, finally dropping the hammer and ordering the inventory to ship off to Amazon can be terrifying. The one question that comes in the mind is how you know for sure that the product you have ordered is actually going to sell out and perform on FBA. Amazon product niche research is something that we have discussed in our earlier posts. We have mentioned how data analytics and data-oriented product research helps us with some hidden reserves filled with potential product ideas. However, it is easier said than done. Product SPY Pro have been always focused on making Amazon product research as easy as possible. Most people are at least loosely familiar with Keyword Analyzer, but if you are someone who is not, we will break it down for you. While product database and amazon real time search(SimpleSpySearch) are making it easier for the sellers to find amazing product opportunities, you can be rest assured that using our Amazon product finder tool it will become four or five times easier to conduct Amazon product niche research. The coolest thing about this Amazon product finder tool is that it helps to find ‘extremely niche market’ ideas. It is the newest way for conducting Amazon keyword research making it easier for the persistent sellers to identify niche opportunities in Amazon. The main goal of this tool is to make product research as insightful as possible with few clicks for making product research much simpler. Figure out the type of niche you would be interested in via Amazon product niche research and select the filter options to sort out the results by category, level of competition, price, number of reviews and monthly demand among others. You have to understand that higher the competition, more difficult it will be to sell. Therefore, you will have to find a sweet spot where there is reasonable demand and less competition in order to your niche to be successful. 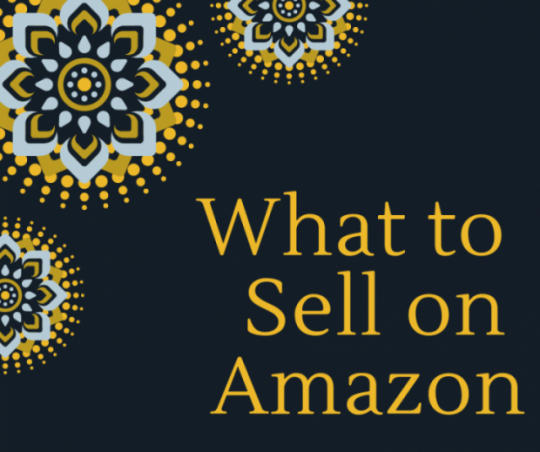 Is Selling on Amazon getting too competitive? Initially, many rookies jump gung ho into organizing their inventory and most of the times they overlook those few subtle signs that could have warned them to much bigger problems down the line. What we are saying is that Amazon is truly getting competitive with numerous sellers selling the same niche. However, there is no denying that considering millions of niches and keywords available within thousands of potential product ideas, there are plenty opportunities to take benefits of! Is this a Good Product Opportunity? Our Amazon product finder tool is composed of an machine learning algorithm weighing numerous inputs that would help you to determine a good product opportunity based on the quality of competitive listings, price, competition, monthly demand, and more. Once you have entered the mentioned options, Amazon Keyword Analyzer will search its database of an array of products and will bring you potential product ideas composed of all the necessary data. Amazon product niche research becomes easy with this tool as the world’s biggest marketplace sells millions of products and you can find plenty of opportunities finding new product ideas making profits from it. How Do You Choose a Product To Sell? Considering the current market trend, most of the Amazon sellers are third party sellers, which is great news for anyone who is trying to sell his/her own product in Amazon.When it comes to choosing a profitable niche from our Amazon product finder tool, you can take two different paths for success. However, it will depend on your starting budget you have planned to work with. Amazon Keyword Analyzer tool is designed to cater all types of Amazon product niche research (the ones that are legal to sell on Amazon). A simple search allows you to have a quick access to all the information of the products to see it makes sense to sell and make profits by considering the listing grade, demand, reviews, and more. Moreover, every product is flagged with a selling potential score that scores between 0-100(Greater the value, greater will be potential opportunity). The scoring is based on various factors like listing quality, reviews, demand, and will also give you advise whether the product you chose is a good product to sell or not. Challenge score is another which you can use and greater the value, greater will be the competition and it make sense to select a product with lower competition with decent sales. On the other hand, the tool displays the top products for an Amazon keyword research along with their price points, reviews, and more. This will allow you to make better decisions while creating a list of possible products to sell. The mentioned two paths are the key to your success in FBA. However, we recommend you choose PATH 1 if you are a beginner because PATH 2 can lead you to serious money down the road given that you are not experienced enough to choose a big product niche. It is always advised to start small and work your way up into building an inventory that covers your overall ‘niche’ requirement. When you conduct an Amazon product niche research for a particular entity say ‘Bathroom’ on our Amazon Keyword Analyzer tool, you may think of selling everything related to Bathroom that includes shower caddies, fog resistant mirrors, drawer organizers, sink, towel holders, towels, and on, and on – everything that you would normally find in bathrooms. You may find it intriguing, but as a beginner; it will put a heavy dent on your wallet when you are testing various products to see which one sells the best. As we have mentioned earlier that the Amazon product finder tool will even help you find the best products that are currently trending on Amazon but seeing too many options available would probably divert your mind. While the products may fall into your checklist for what makes a good FBA product to sell, having so many different options will limit the amount of resources and time you can spend on each one to get them started to sell and perform well. This is where Amazon Keyword Analyzer is different from other Amazon product finder tool. As the tool displays the top products based on the criteria that you have selected, you can also track the sales of the products from your checklist by simply adding them to our product tracker. This will allow you to review and analyze the sales data of every product giving you a general idea of which product to choose from the list. What Does Using Keyword Analyzer Mean for You? Keyword Analyzer shows you the products that are useful, purposeful, smart, and specially crafted for a very specific niche market. When you perform Amazon product niche research or browse through the listings, you will find out-of-the-box products that may suit your target audience. Moreover, you can do Amazon keyword research on products falling into categories that caters to women, children, and men. You can search for clothing apparel, electronics, home essentials, furniture, accessories, décor, supplies, books, collectibles, toys, tools, and a lot other items. 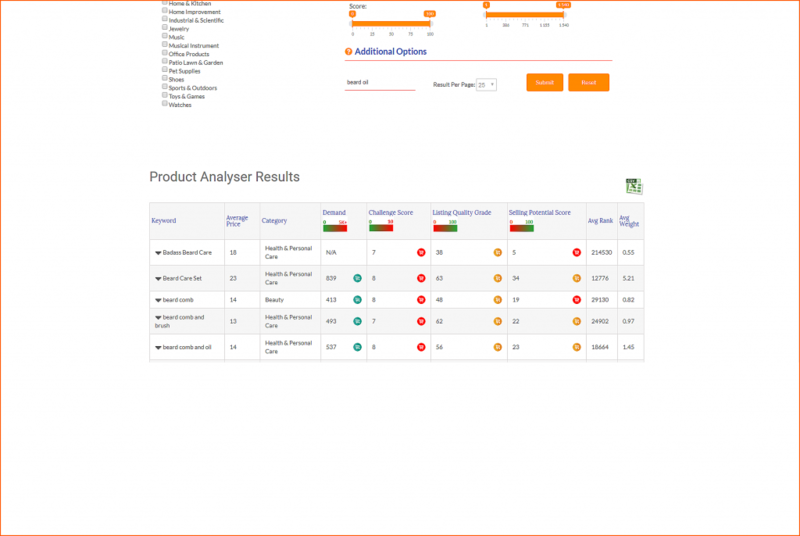 Our Keyword Analyzer tool allows the users to search for product ideas by either using the search option or by browsing through the categories. To make it more easy and subtle, the searches can be done on the basis of the newest items available, what is trending, and the best pick. If your Amazon product niche research is for ‘beard oil’, Keyword Analyzer will provide details about the top different brands selling the same product including multiple images of the products so that it can give a taste of what else could be done to enhance products like these. 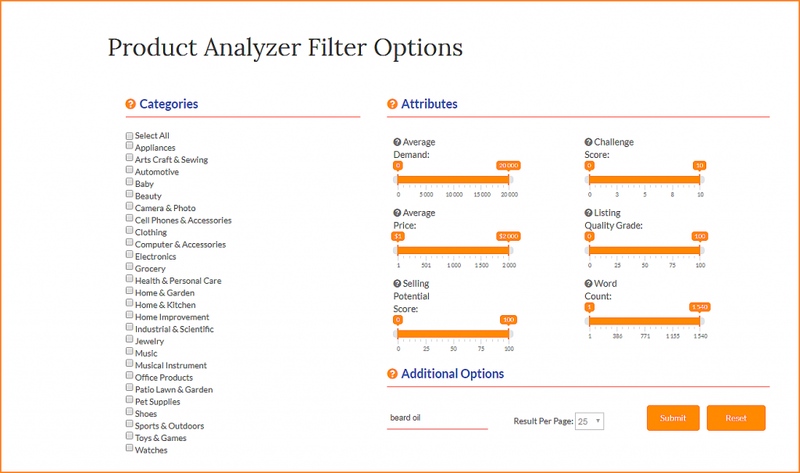 With just one click, you can add the product you find intriguing to your Product Tracker. This will help you in conducting proper due diligence by collecting actual Amazon sales data of that particular product before making any final decisions. You can simply click on the product and it will immediately take you to the actual Amazon product page where you can get the better understanding of the quality of reviews, product images, product title, and other criteria you are looking into for complete evaluation of the product. So What Really Makes a Good Niche that Will Sell and Perform Well on Amazon? Now that you know how you can use the Keyword Analyzer tool for conducting Amazon product niche research finding the potential products or niche according to your target audience, the main question that seek answer is how do you choose a product to sell. Here is a basic list of help to get you started. It is always important to determine the visibility of the product. When you perform the Amazon keyword research, you have to know that how much profit you are eyeing before you place an ordering the inventory from the supplier. In our experience, the products within the price range of $10 and $50 has the highest probability of selling at a high volume. This is because you buyer is not going to spend hours researching to find the best product. As long as your buyer thinks yours is a good fit, he/she will purchase it without thinking twice about the decision. This is the reason you should analyze the product by looking at the actual Amazon sales data. Best case scenario, your product would be a light as a feather, and cost just about nothing to ship. However, this is not always the case with selling products on Amazon FBA. The general rule of thumb states that larger the size of your product, higher will be its weight. When the weight and size both increase, it will severely increase the shipping charges – reducing your overall profit margins. When it comes to determining the shipping weight, you need to determine the total weight of the box Amazon will be shipping that includes the item, slips and packaging, and the box itself. When you perform Amazon product niche research, the chances of you finding the similar niches is more. But as discussed earlier why you should take PATH 1, you need to figure out how often certain similar products sell on Amazon. The best approach you can follow to tackle this dilemma is the ‘Best Seller Rank (BSR).’ The Best Seller Rank tells you how well an item is performing within its particular category. What we are saying is that if an item has a BSR of 5000 then it is going to perform/sell a lot less as compared to an item with a BSR of 500. Lower the BSR, higher will be the chances your product performing well, particularly when it is inside a huge category. It is always advised for the beginners not to compete with large brands. Taking on the big guns in your chosen product category will only result in your FBA business biting the dust. Our Amazon product finder tool will help you in finding a category that has much weaker completion. Brand recognition plays a crucial role in driving sales and something that beginners are not going to have as they are just getting started. When you are finding new Amazon FBA product ideas on Keyword Analyzer another piece of puzzle you need to put together is the kind of product that you are actually going to sell. You should sell those products that are simple yet not easily damaged or broken during the shipping. Amazon daily adds more than 500,000 new products to its store that is ultimately synced to our Keyword Analyzer tool making it easier for the beginners to find more Amazon product niche research opportunities. We are excited about the potential our Amazon Keyword Analyzer tool offers the Amazon sellers. Sign up for free trial and get started with hunting new niche opportunities as they are in abundance. Keyword Analyzer is the smart tool to discover emerging niches and find new profitable products that fit your niche.